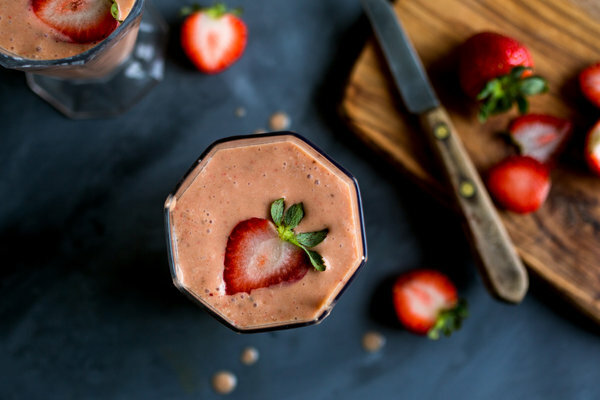 Fruity pomegranate molasses is the perfect sweetener for this thick strawberry smoothie. This summer I bought a flat of strawberries, and soon afterward realized that they were going to go off before I had a chance to use them. So I hulled them and froze them in small freezer bags (a heaping cup, or 6 ounces, per bag), and now I’m using them for smoothies. When I was working on this smoothie I felt that it needed something to sweeten it, but what? I looked in my cupboard and saw a bottle of pomegranate molasses, and voilà! Now I know that pomegranate molasses, with its fruity, tangy yet sweet flavor, is perfect for red fruit smoothies of all kinds. This one is enriched with cashews, soaked in water for a few hours or overnight, chia seeds (also soaked), and oatmeal. Share the post "Frozen Strawberry-Coconut Smoothie With Pomegranate Molasses"
just good food from fresh ingredients.